Lady hams in Las Vegas just concluded their very first YL themed net. Sponsored by the Sisterhood Of Amateur Radio (SOAR) this unique net had its ignaugaral outing Wednesday November 21st. Operating on the KP4UZ repeater, SOAR President Elizabeth Bigley-KD7RIN acted as the first Net Control Operator. Elizabeth has some experience as an NCO as she held the reins several years as the full time Net Control for the old Saturday Night FARS Net. The SOAR Net is open to both YL's and OM's. The Net is designed to give YL's their own gathering place for round-table ragchewing and to discuss events and topics which have a particular interest to women and girls in amateur radio. ARRL Nevada Section Manager Joseph Giraudo-N7JEH has announced the appointment of Don Carlson-KQ6FM to the position of Assistant Section Manager. Also Glenn Hale-KB7REO has been appointed as the Nevada Section Emergency Coordinator. Annual elections for club officers are currently taking place throughout Nevada. Nevada Amateur Radio Newswire will be post those results here as they become available. Nevada amateur radio newswire is born! While interest in amateur radio continues to grow, one traditional mainstay of ham radio and particularly of ham radio clubs, the newsletter, appears to be falling by the wayside. For most of the past century joining a radio club would guarantee the member their own personal newsletter each month. There were newsletters, bulletins, DX sheets, etc. of every type and description. These ranged from a couple of purple smudged mimeographed sheets with a single staple, to elaborate, professionally produced booklets and tabloids. The best came via the U.S. Post Office while others were simply left in a pile at the back of the club meeting room. Regardless of their level of production they all held several things in common. First of all they kept the amateur community informed of ham radio happenings, both near and far. People looked forward to getting the next copy. They often justified the collection of dues. A good newsletter could swell the membership rolls. But time marches on. Many clubs find it difficult if not impossible to recruit someone to edit a newsletter. Print versions have all but vanished in favor of the few remaining on-line editions. It is not uncommon for someone to volunteer to take on the task of producing a newsletter, only to find that they are unable to amass any significant content. With the proliferation of Internet postings it frequently appears that much of the "news" about ham radio is expired or has become stale before it can be published in a newsletter. The one exception is local and regional information. Information which was once passed between local ham clubs via their newsletter exchanges no longer flows from point to point. So it is with these thoughts in mind that the Nevada Amateur Radio Newswire is created. The Newswire hopes to post information about Nevada radio club happenings, public service events, features on local hams, and other items of an interest to hams in the Silver State. Newswire will interview club officers, vendors, and everyday hams and try to bring their stories to amateurs in Nevada. Additionally, you will find a form for submitting items for inclusion on these pages. Please understand that Newswire is in its very early stages of development and will be updated and improved on a daily basis. The Board of Directors of the Sierra Nevada Amateur Radio Society has announced the approval of their Field Day site. This years activities will take place June 22-23 at Arrow Creek and Wedge Parkways, across from the library. Plans call for operations on 80-10 meters CW, Phone, and Digital modes, using the call W7TA. Elmers will be on hand to assist newcomers and there will be an information table. A Bar-B-Que lunch is planned. 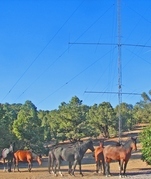 The Nevada QSO Party-dubbed "The Nevada Mustang Round-Up" kicks off at 10:00 AM (17:00 UTC) tomorrow morning, (Saturday May 11th). The event is the second of three yearly contests that make up the "Silver State Series" of contests with Nevada as a focus. The Mustang Round Up follows behind the 7QP contest held a week earlier. Traditionally, the Nevada QSO Party was held on the first weekend in May, but several years ago the organizers of the 7QP moved their contest to the same weekend which created a conflict for the Nevada contest. Because of the relatively small number of Nevada Hams participating in the event, it has been possible the past two years for every ham entering from Nevada to walk away with a plaque or award. Began in the 1980's by the Frontier Amateur Radio Society in Las Vegas, for many years the event was spearheaded by Jim Fry-N7WO. When Jim moved to Montana 10 years ago, FARS turned the reigns over to Fred Homuth-K9GAJ who administered the event for one year. The following year the AREA 51 Contest Club announced that they were sponsoring the NQP, which came as a surprise to the members of FARS. In the interest of harmony in the amateur community FARS decided to quietly fade out of the picture. The AREA 51 group ran the contest for two years before a group in Elko announce that they were sponsoring and renaming the event as the "Nevada Mustang Round Up". The work by the Elko group was primarily being done by one person, Dave Hough-W7GK. The Elko group operated the contest for three years before handing it back to the Frontier Amateur Radio Society a week and half before the 2011 event. FARS lost no time in handing the NQP away to FARS President John Bigley-N7UR who now performs all the tasks associated with the NQP. Beginning with the 2011 contest. John expanded the NQP to become a season of contesting for Nevada hams. The "Silver State Series" begins with the 7QP which joins all of the states in the Seventh Area Callzone in one contest, the second is the traditional NQP-Mustang Round-up, both of these contests are in May. The final contest in the series is the fast paced September "High Noon Shoot-Out" which operates as a "sprint". 2011 also saw Nevada getting its first ever website for their contests. www.nevadaqsoparty.info provides contest participants a single resource for information on Nevada's ham radio contests. Awards and results had not been given for several years, which added to the decline in participants in the NQP. In 2011 the NQP began awarding ceramic/walnut sublimated plaques for category winners, as well as heavy, silver embossed certificates for 1st place state, province, and DX finishers. Typically only the biggest QSO parties, such as Florida and California award plaques. Most states simply award a photo-copied certificate and many just issue their winners a link to a PDF file of the certificate. Of the states that award plaques, all of them, with the exception of Nevada, require a corporate or personal sponsor for each plaque, the categories that do not attract a sponsor are not awarded. In the Nevada QSO Party the costs, production, and shipping for all of the awards is provided by N7UR. The Amargosa Amateur Radcio Club will operate their 2013 Field Day Station from Funeral Mountain Ranch on Casada. Set-up will begin Friday. The group plans to be on the air on all band s 160 thru 2 meters. CW, Phone, digital, and satellite modes will be used.